Home Thoughts Opinions Where is American Anger Over Bankrupt Obamacare Exchanges? Where is American Anger Over Bankrupt Obamacare Exchanges? Americans have become so used to the multi-trillion dollar deficits that our politicians have saddled us with, that the latest announcement of the $17.5 trillion dollar deficit hardly raised an eyebrow. This week, we also heard that the Obamacare exchanges cost four states almost a half-billion dollars in federal money. Compared to the total deficit, you might think that is no big deal, based on the reaction it is getting from most quarters. We have always known that government was inefficient, but now we know it is completely inept, except for one thing – it is very good at wasting taxpayer money. Actually future taxpayer money, because it comes from money-printing that will need to be paid back one day. Those states are wondering whether they should spend more to build their own state Obamacare exchanges or should they collect even more federal dollars? The federal exchanges currently provide services for 36 states. The cost of this is billions more than the administration ever expected. Note to the Obama Administration: we are not surprised, it is par for the course for your estimates to be completely useless. Some of the state exchanges accurately define the word “mess.” These include four blue states that are considered failures – Massachusetts, Oregon, Nevada and Maryland. To give them a second chance, the government is picking up their tab, and writing checks. The other option is to dump them into the federal website. 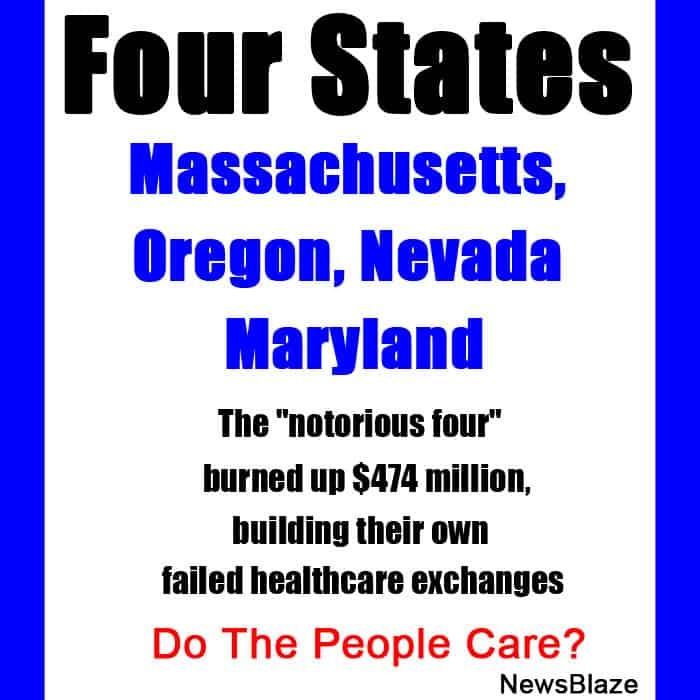 The “notorious four” already burned up $474 million, building their own healthcare exchanges. Now we hear that Minnesota and Hawaii are about to wave the white flag too. The Kaiser Family Foundation estimates that since 2011, the federal government approved $4.7 billion for states to create their own exchanges. How can they possibly spend almost $5 billion just on websites? It makes no sense at all. “Cover Oregon” has to be seen as a completely incompetent organization. Oregon’s state health care exchange opened on October 1, 2013 and it has suffered constant failures ever since. Last month, the “Cover Oregon” board decided to give up on their own exchange, cut their losses – $303 million, and dump the responsibility for their exchange onto the federal government. By that time, they had gone through four different head administrators. Their online system was so bad that it never even went live. Oracle Corp. was the contractor, probably something they will not want to acknowledge ever again, even though they were happy to receive $134 million in federal funding. We are told that paper processing cost the state government $7 million. The final number of enrollees through the $303 million non-functional website? Zero. There is no need for Massachusetts to be smug about Oregon’s foibles, because their debacle was almost as bad. Officials in Mass. want to start again, building a new site from scratch. To allow their residents to sign up for healthcare, they will use the federal exchange until their is ready – assuming it actually works when they have finished. Politico reports the state already spent $170 million, and the estimate for the new exchange is more than $120 million. Nevada spent $51 million out of the $90 million to build its own non-functional website. We are told the system cannot be salvaged. Nevada’s federal Senator, Harry Reid, points the finger at Xerox for the problems. Maryland officials knew early on that their website was a mess. Known as the Maryland Health Connection, it was allocated $170 million. The Washington Post reported they announced the website would not be able to launch. It must be nice to have hundreds of millions of printed dollars to burn. It amounts to corporate welfare. Many pundits expect that State health exchanges will continue to cause headaches for the politicians, who seem to thing that engaging “a programmer” will fix all of their problems. Unfortunately, that is usually just the start of a new set of problems. Our politicians are by now used to squandering billions of taxpayer dollars. The Queen of Obamacare, Rep. Nancy Pelosi, isn’t even taking any notice of Obamacare now. She has moved on to the next debacle, trying to ward off another Benghazi investigation. She called the murder of four Americans a done deal that has been thoroughly investigated. Have Americans completely given up on expecting positive results from what their government does? Is there national anger over the billions wasted, or are we just too numb from the beating our finances are taking? The Republican National Committee filed public-records requests in Hawaii, Maryland, Massachusetts, Minnesota, and Oregon, seeking information about compensation and vacation time for the state exchange directors, many of whom have resigned, according to The New York Times. As usual, even when the ship of state is burning around them, politicians have their eye on the next election. Five states with Democratic governors are heading for elections this year. Three of them, Gov. Neil Abercrombie of Hawaii, Gov. Mark Dayton of Minnesota, and Gov. John Kitzhaber of Oregon have already launched their bids for re-election. Nevada is the only state with a Republican leader, with a failed state exchange, and Governor Brian Sandoval is also seeking reelection. Will Americans wake up from their numb stupor, and say enough is enough? Or will they just be compliant plebs, waiting for their masters to tell them what to do – shell out more money to be wasted?